In order to configure SSO between IDrive and IdP, Standard Assertion Markup Language (SAML) is one of the standards used. For implementing SAML authentication, SAML URLs and Certificate are needed, which can be obtained from any supported IdP. This URL uniquely identifies the application for which single sign-on is being configured. This URL processes an authentication request from the user's browser and returns an authentication response to verify the user. An X.509 certificate is a security certificate that you receive from your identity provider to verify your identity. It comes in different formats, but IDrive only accepts .pem or .cer format. 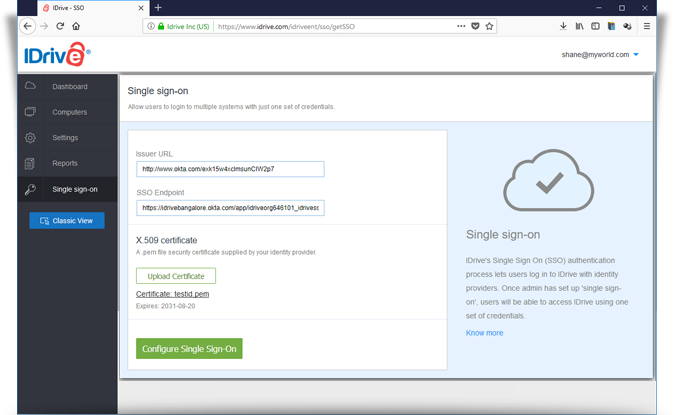 Before users can proceed to login with Single Sign-On in IDrive, an Admin needs to provide the received SAML URLs and Certificate in the SSO section of IDrive. Go the Dashboard tab, and click the Single Sign-On tab on LHS. Enter the URLs and add the X.509 certificate received from your IdP. Note: The X.509 certificate should only be in .pem or .cer format.